Space technology has a wide range of industry uses within the agricultural sector. The Precision Pastoral Management System (PPMS) is an instructive case example and has improved productivity and profitability for Northern Territory pastoral estates. 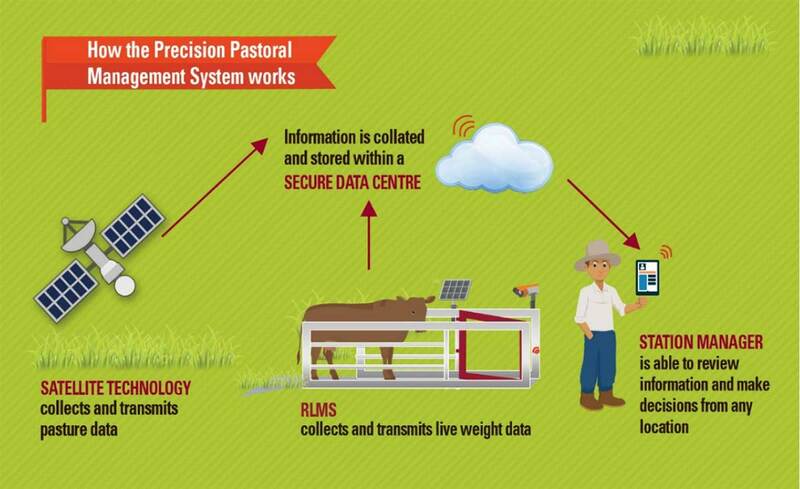 The PPMS remotely monitors the performance of cattle and pastures through NASA Landsat satellite technology, in combination with the walk-over-weighing system. The cattle, individually identified via an ear tag, walk over a weighing platform, and this data is recorded and uploaded via satellite to the pastoralist. The NASA Landsat satellite technology also allows for remote sensing of pasture conditions by tracking changes in the growth, condition and grass diversity of the land. This information is then analysed and summarised through weekly reports, and includes information on live weight data of individual animals, and pasture condition and availability. The farmer can view this information at any time and from any location via a customised website. This technology was developed in Alice Springs in the Northern Territory by scientists at the Cooperative Research Centre for Remote Economic Participation (CRC-REP), and trialled at five Australian beef cattle stations across north Australia. All told, it incorporates automatic weighing and drafting, automated communication processes, cloud-based analytics, satellite observation, and water management. Benefits include: reduced labour and increased productivity, improved decision-making and responsiveness to environmental conditions, and long term sustainability through access to the data needed to adjust stock numbers and rest paddocks in response to conditions.